Lineage. Constituted 422d Night Fighter Squadron on 14 Jul 1943. Activated on 1 Aug 1943. Inactivated on 30 Sep 1945. Redesignated 422d Fighter Weapons Squadron on 22 Aug 1969. Activated on 15 Oct 1969. Redesignated 422d Test and Evaluation Squadron on 30 Dec 1981. Assignments. Air Defense Department, AAF School of Applied Tactics, 1 Aug 1943; 481st Night Fighter Operational Training Group, 29 Oct 1943; AAF Tactical Center, 6 Jan 1943; Ninth Air Force, 7 Mar 1944; IX Tactical Air Command, 12 Mar 1944; 71st Fighter Wing, 4 May 1944; IX Air Defense Command, 6 Aug 1944; IX Tactical Air Command, 7 Oct 1944-30 Sep 1945. 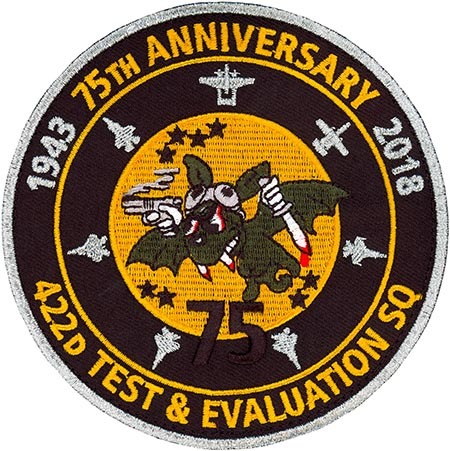 57th Fighter Weapons (later, 57th Tactical Training; 57th Fighter Weapons; 57th Fighter) Wing, 15 Oct 1969; 57th Test Group, 1 Nov 1991-. Stations. Orlando AB, FL, 1 Aug 1943; Kissimmee AAFld, FL, 3 Nov 1943; Orlando AB, FL, 6 Jan-13 Feb 1944; Charmy Down, England, 7 Mar 1944; Scorton, England, 6 May 1944 (detachments operated from Hurn, England, 28 Jun-11 Jul 1944, and Ford, England, 16-c. 26 Jul 1944); Maupertus, France, 25 Jul 1944; Chateaudun, France, 28 Aug 1944; Florennes, Belgium, 16 Sep 1944; Strassfeld, Germany, 6 Apr 1945; Langensalza, Germany, 24 Apr 1945; Kassel/Rothwesten, Germany, 26 May-Aug 1945; France, Aug-20 Sep 1945; Camp Myles Standish, MA, 29-30 Sep 1945. Nellis AFB, NV, 15 Oct 1969-. Aircraft. DB-7, 1943; P-70, 1943; YP-61, 1943; P-61, 1944-1945; L-6, 1944; Oxford, 1944; C-78, 1944; A-20, 1944-1945. Operations. Combat in ETO, 3 Jul 1944-4 May 1945. Apparently conducted operational testing and evaluation of aircraft weapons systems, including F-111, F-4, A-10, F-15, and F-16, 1969-. Campaign Streamers. World War II: Normandy; Northern France; Rhineland; Ardennes-Alsace; Central Europe; Air Combat, EAME Theater. Decorations. Distinguished Unit Citation: Ardennes Salient, 16/17 and 27/28 Dec 1944. Air Force Outstanding Unit Awards: 25 Oct 1969-25 Sep 1971; 1 Jul 1984-31 May 1986; 1 Jan 1987-31 Dec 1988; 1 Jan 1989-31 Dec 1990. Emblem. Approved on 29 Dec 1943.